It was established before old Greek tribes started colonising the Aegean. The historians agree that Carians are Anatolian indigenous. According to Herodotus, the name of Caria is derived from their legendary king Car. It is also confirmed by modern linguistic; the Carian language that belongs to the Hittite-Luwian subfamily of the Indo-European languages is a local Anatolian language. 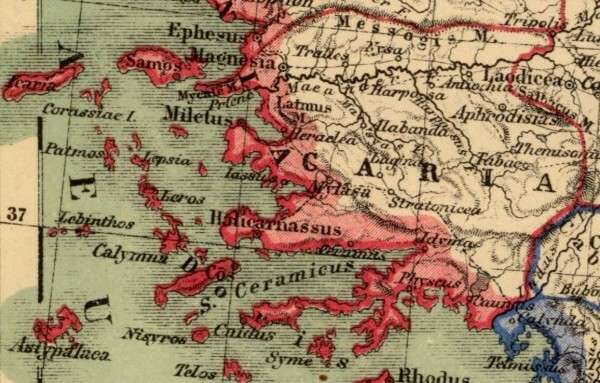 It is related to Lycian, Lydian and Mysia (Misya) the languages spoken to the southeas and north of Caria. The Carians themselves maintained that they were Anatolian mainlanders, according to Herodotus. Milet (Miletos) was the city of Caria during the Troy wars but later on it became one of the Ionian cities mentioned by Homer at his Iliad. There are some clues to indicate the undefinited relationships between Carians and Lelegians (who were the earliest indigenous in Anatolia). Historian Philippus of Theangela (which was around Halicarnassus), suggested that the Carians were a higher class than the Lelegians in the structure of society at his work. 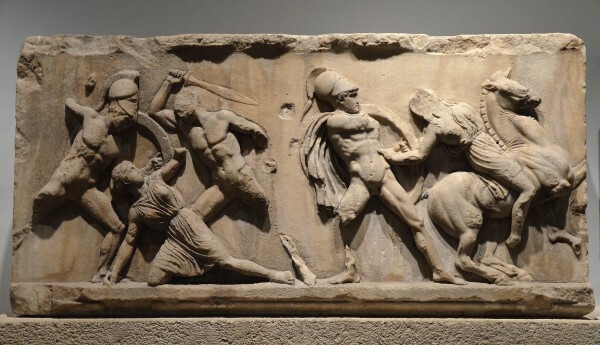 Therefore, it is thought that when Carians started to invade the Aegean Islands, they reigned the Lelegians. Strabon also wrote about their relationships as he mentioned that they were not able to distinct from each other as they had mixed socially. Therefore the Greeks started the invasion, both Caria and Lelegians pulled back to Anatolia together. It can be understood that some Lelegians had succeeded to continue their identities for a while, after Mausolus made Halicarnassus a capital city, 6 of 8 Leleges cities had to be moved to the capital. 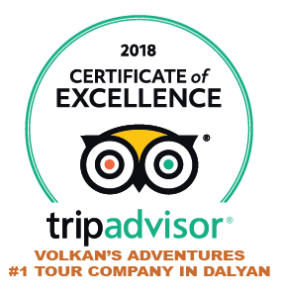 The locals of Caunos (Dalyan) in the city within the Lycian borders in the Carian region have built relationship with Crete island. This indicates that they protect its original identification throughout the period of Caria. Etymology of the words Car and Caria have not been definited yet. 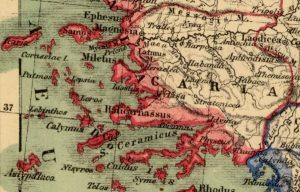 It is believed that the word of Caria in Luvian language means ‘triple countries, steep land’ and the word of Caria is the old Greek version of the word “karuwa” meaning “steep land” in Luvian. Besides Homer, Herodotus and Strabon’s writings, Carians are refered as mercenaries in Tevrat and in Egyptian inscriptions. The inhabitants from Caria are also known as Karkija in Hittite’s inscriptions, as Karsa by Babylonian and as Kurka in Persian language. Caria kept its independence between the 11th century BC and 545 BC. They were engaged in sea faring. When the old Greek colonies started to appear on the shores, Caria went on ruling within the inland. The Carians became Persians satraps after 545 BC. 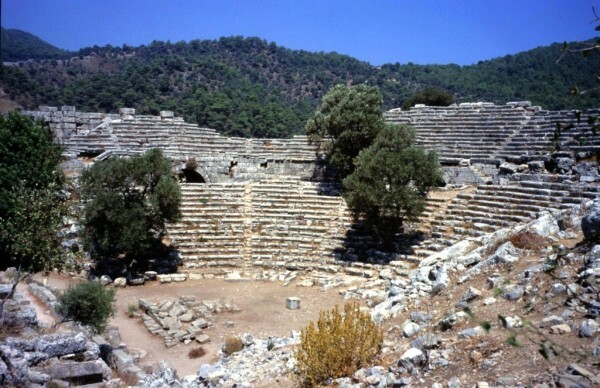 Halicarnassuss(Bodrum) became a very important city for local thornity and Persian satraps. 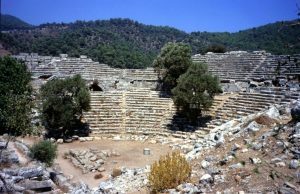 The other important settlements were Mylasa(Milas), Latmos Herakleisa (Kapıkırı village around Bafa Lake) and Alabanda (Aydın, Cine). 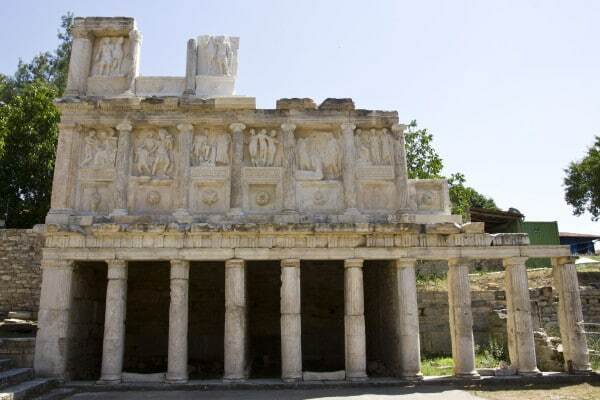 Aphrodisias was established as a Carian marble quarry and became a developed city thanks to the privileges’ by Roma at the end of 39 BC. The importance of the city continued until the period of Byzanthine Empire and became the centre of antique age. The period after the 6th century BC is better known in Carian history since historical records are enriched during the period of Persian occupation and the wars between Persian and old Greece. At this time they reigned Halicarnassus (Bodrum) which was the first important port city and Mylasa (Milas), the second important port city in the Carian period. There were two important dynasties that came across in history and took advantage of these port cities. 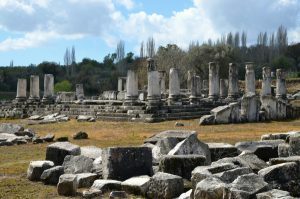 There is the possibility of the third dynasty at Idyma (Akyaka) that may had reigned the region. The Caria of Artemisia joined the Salamis Navy Battle (480 BC), she was one of the commanders of the Persian Satraps, Hecatomnus (early 380 BC) governed Caria, Mausolus famous with his Mausolleum (377-353 BC), his son Idrieus (351-344 BC), his son Pixadarus (340-334 BC) and Ada (early 344-340BC) were the members of the dynasty. Boxer Melankomus who was a Carian had been Champion a few times at the Olympic Games during Roman Empire. Because the centre of fig production was in Caria, the name of ‘düzincir’ (commonfig) is called ‘Aydın Inciri’ by locals and ‘Ficuscaria’ in Botanic.